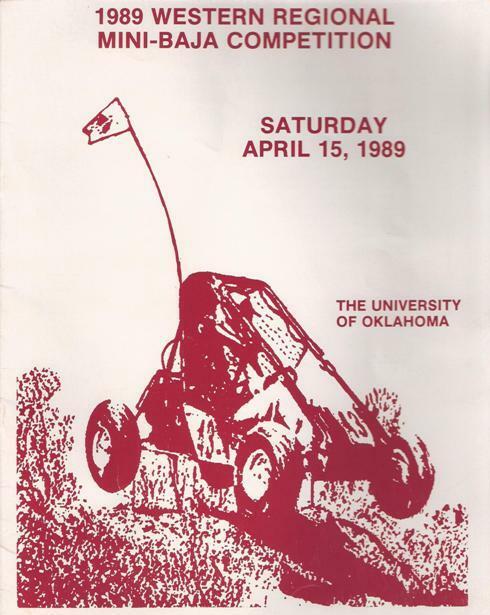 On April 13, 14 and 15, 1989, Leon MacKechnie and the Oklahoma Region assisted the Oklahoma University Engineering Department in conducting the SAE Western Regional Mini-Baja Competition. The object of this event is to measure the vehicle’s performance in acceleration, top speed, and braking. The three evaluations are made on a 200 foot straight run. The lirst 100 feet are used for acceleration and the second 100 feet for top speed. The braking distance is measured from the 200 foot line. The skid-pad event measures the cornering ability of the vehicle. The skid-pad consists of two adjacent circular paths of 30 and 20 foot radii. The vehicles enter the path at the common point and traverse one circle in a clockwise manner and the other in a counterclockwise manner. The vehicle with the lowest time to complete two consecutive laps wins this event. Points are deducted for each boundary marker contacted during the run. The purpose of the hill climb is to test the traction and the ability of the vehicle to maintain contact with the surface. The hill is thirty feet high with an initial slope of 45 deg. The final slope is 60 deg. Points are awarded according to best elapsed time or maximum height achieved in climbing the hill. Vehicles which can negotiate tight turns, accelerate quickly, slow down in short distances, and corner well will excel in this event. The purpose of this event is to evaluate the vehicles ability to negotiate rough terrain at maximum speed without sustaining damage. 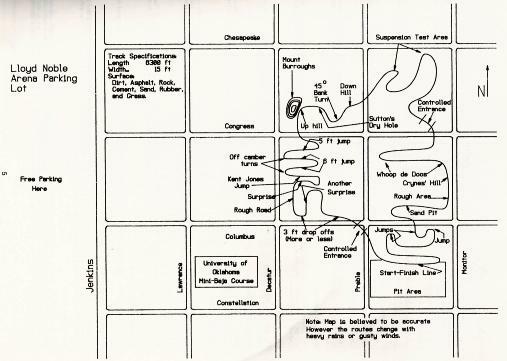 The track (see map in this program) is a tortuous path 6300 feet long, 5-15 feet wide over a multitude of natural and synthetic obstacles designed to test the vehicle’s reliability in a short time. The vehicles are scored according to the number of laps completed in the four-hour allotted period. Teams are allowed to repair vehicles during the endurance event. 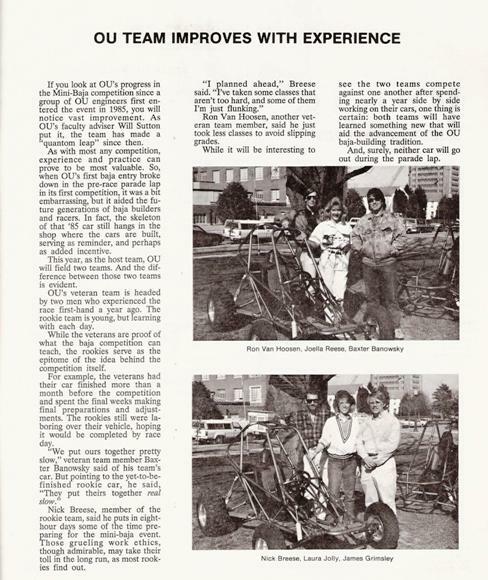 The endurance event involved many SCCA volunteers, especially race drivers and flag and communications workers. It was essentially a four hour race held on the OU South Campus, East of Lloyd Noble Arena. In 1989 all of the World War II housing had been removed, but many of the foundations and concrete steps remained. These steps were used as obstacles to climb UP, or jump OFF. The 30 thirty foot high Hill Climb (Mount Burroughs) was part of the course, as were many artificially built “Whoop de Doos” and banked turns. “Sutton’s Dry Hole” was in reality the WWII concrete swimming pool with a “jump" into the shallow end and a sand bank ramp out of the deep end. My memories of the endurance event were sheer pandemonium. Several Red Flags were thrown as competitors would break down and block the course. Some contestants could not drive up the steps because of ground clearance designs (best for the Maneuverability event) or structural failure. The air reeked of burning oil and hydraulic fluids. One interesting happening involved both the entries from Chiuahua (as in Mexico) University. Their machines were continually throwing their drive chains. One very brave student’s job was to lube the chains at every pit stop. The vehicles would be put on jack stands, and “Stubby” as we called him, would pour oil into his cupped hand and let the chains run through the oil, AS THE ENGINES and CHAINS WERE RUNNING. Hence his knickname. I can’t find the final results for the event, but I think OU won several events and finished in the top three.